Spring is almost here, which means beautiful California weather and outdoor parties! Now that you’ll be entertaining more, perhaps it’s time to finally update the kitchen. Does your kitchen look dull and tired? Too many grease stains to even count? 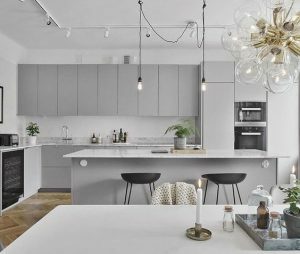 Give your kitchen a fresh new look with these TOP Kitchen Paint Colors for 2018. Greens: From Sage Green to Apple Green, it’s earthy, warm, and looks amazing next to wood accents. 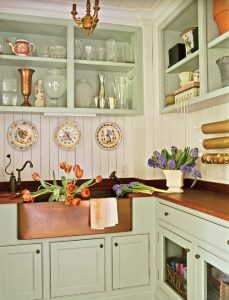 Give your kitchen an organic vibe this Spring with this lively color. 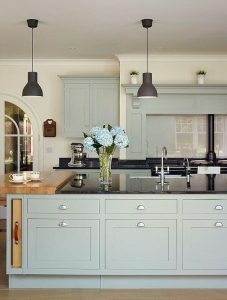 Blues: Any shade of blue works well in a kitchen. 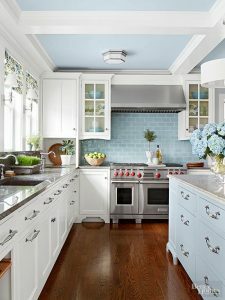 Benjamin Moore’s, Come Sail Away blue is crisp and airy, as if a cool sea breeze has just washed over your kitchen. It pairs well with ivory accents, bringing in a beachy and calm atmosphere. If you’re going for a more modern look, try Royal blue. Often seen on kitchen cabinets and islands, it’s vibrant color that looks sophisticated next to stainless steel appliances and bright white accents. Greys: Grey brings a sense of shadow that softens the environment. In the dark, certain greys can appear almost black, but with lots of sunshine it can also bring life. Grey is a fun color because it changes a lot in different conditions. Grey pairs perfectly with black appliances and white marble countertops. Reds: If you want a completely new look for your kitchen, go for red. All different shades of red can really enhance the character of a kitchen. But be careful with this bold color, because it can appear overpowering if not used sparingly. 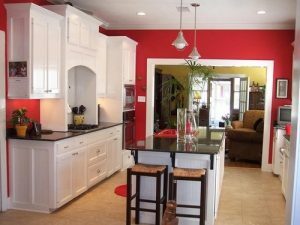 If your kitchen is mostly cabinetry, try painting the walls Red Geranium. It will add a pop of excitement to your seemingly dull space. If you’re not quite ready to dive into this bold change, but love the color red, you can always turn to pale pink. Pale pink is more muted, unlike candy pink. Pale pink can be a refreshing start to your new kitchen.